Cerebrovascular disorders refer to a number of conditions that in children are typically linked to congenital malformations (conditions the child was born with), of the arteries and/or veins that circulate the blood supply throughout the brain. Many of these conditions can increase the risk for hemorrhage (excessive bleeding) or stroke due to compromised blood flow. In all of these cases, there is the risk of brain damage. Aneurysms are rare in children and typically are due to congenital weakness of the walls of the arteries and veins. Sometimes these are discovered through testing for other conditions, and when found, surgery is frequently recommended because ruptures can result in hemorrhage. Arteriovenous malformations (AVMs) result from non-development of the capillaries between arteries and veins. This produces an enlargement of the vessels, as they try to compensate and create pathways for the blood to flow, leading to a large tangle of vessels and abnormal or compromised blood flow. This disorder can affect the heart as well, and may even present as heart failure. AVMs can also put pressure on parts of the brain, blocking the flow of fluids and resulting in hydrocephalus. Moyamoya malformations are rare, progressive, cerebrovascular disorders caused by blocked arteries at the base of the brain. The term “moyamoya” means “puff of smoke” in Japanese, the language of the physicians who were the first to diagnose the condition. Moyamoya disease involves a tangle of tiny vessels that develop to compensate for the blocked arteries at the base of the brain, and that tangle looks like a “puff of smoke.” In children, the first symptom of Moyamoya disease is often stroke, frequently accompanied by muscular weakness or paralysis affecting one side of the body, or seizures. Because it tends to run in families, researchers think that Moyamoya disease is the result of inherited genetic abnormalities. Vein of Galen malformations are complex because they are positioned deep within the brain and typically involve many of the major vessels – arteries and veins. The malformation is a congenital defect which can manifest as heart failure along with hydrocephalus. In some cases, it is the combination of symptoms that points to these rare disorders, especially when both hydrocephalus and heart failure are present in a child. Children with suspicious symptoms receive a thorough evaluation. If symptoms are severe, a CT scan may be used for a rapid read of the situation. More thorough diagnostic tests such an MRI (magnetic resonance imagining), or an MRA (magnetic resonance angiography) can reveal that major or fine arteries or veins in the brain are malformed, overgrown, and/or tangled. MRIs and MRAs are non-invasive tests that deliver high-resolution images. An endovascular cerebral angiogram is invasive, but provides highly detailed resolution, which is vital in these cases. The same techniques used to do a cerebral angiogram also can be used to treat the blocked arteries and veins. Sometimes tests are frightening to infants and children, and if needed, we call on a large team of pediatric anesthesiologists and Child Life Specialists to offer the level of sedation needed, resulting in clear images and assuring the safety of our patients. Depending on the nature and location of the malformation, the Children’s general surgery team may recommend open surgery, minimally invasive surgery, or endovascular surgery. If the malformation is placed deeply or close to critical structures or nerve pathways, minimally invasive approaches may be recommended. In some cases, endovascular occlusion (closing off of a vein or artery) is used as a temporary measure to allow for eventual surgery which will be safer once the child has grown and the brain and its vessels are somewhat larger. Each case is treated uniquely and the entire neurosurgery team is highly skilled at the full range of approaches appropriate for these relatively rare conditions. 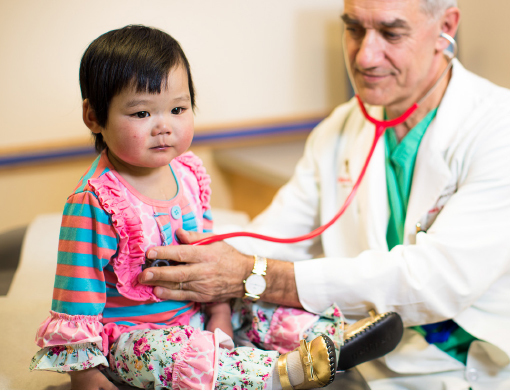 Intraoperative neuro-imaging and continuous neurophysiological monitoring are integrated into all neurosurgeries at Children’s to assure best outcomes with our small patients. Aneurysms require delicate care as a rupture can cause hemorrhage and brain damage. The Children’s team includes one of the country’s leading interventional neuro-radiologists and one of the country’s leading surgeon-experts in gamma knife, stereotactic radiosurgery. The team coordinates with colleagues in hematology and the neuro ICU. Throughout this delicate surgery, we track progress through intraoperative angiography and real-time functional MRI imaging. Arteriovenous malformations (AVMs) are typically treated aggressively through surgical removal and bypassing of the tangled vessels since rupture of an AVM can result in severe hemorrhage. Moyamoya malformations can be treated with several types of revascularization surgery that can restore blood flow to the brain by opening narrowed blood vessels or by bypassing blocked arteries. Children usually respond well to revascularization surgery, and have no further strokes or related problems after surgery. Without treatment, Moyamoya disease can be fatal as the result of hemorrhage. Vein of Galen malformations require delicate and often dangerous surgery as they are placed deeply in the brain. In the majority of cases, endovascular embolization (shutting down some of the vessels with microscopic filler) will reroute the blood flow to effectively treat this vascular abnormality. If hydrocephalus develops in the meantime, a shunt may be placed to allow draining of excessive fluid. Our neurosurgery experts provide advanced care for newborns and children with complex neurological conditions. Our pediatric neuroscience team is the largest in the country, allowing us to offer our vast experience to patients and families.